Richard Koh Fine Art (RKFA) brings the colours of South East Asia to the inaugural art fair START, at Saatchi gallery in London, UK. START, presented by Prudential was held from June 26 – 29, 2014. The fair, dedicated to supporting international galleries from both the world’s most exciting emerging markets and established artistic centers, featured exciting young galleries from all over the world. It was Richard Koh Fine Art’s first art fair presentation in Europe. The first edition of START Art Fair presented by Prudential was well received after receiving universal praise for its fresh approach. The preview day saw 2,200 VIP guests through the doors in just 5 hours, with total visitors over the 5 days exceeding 11,000. With only 46 exhibitors, the focused approach of the fair allowed for more attention on each exhibitor in which the beautiful setting of the Saatchi Gallery frames the works very well. 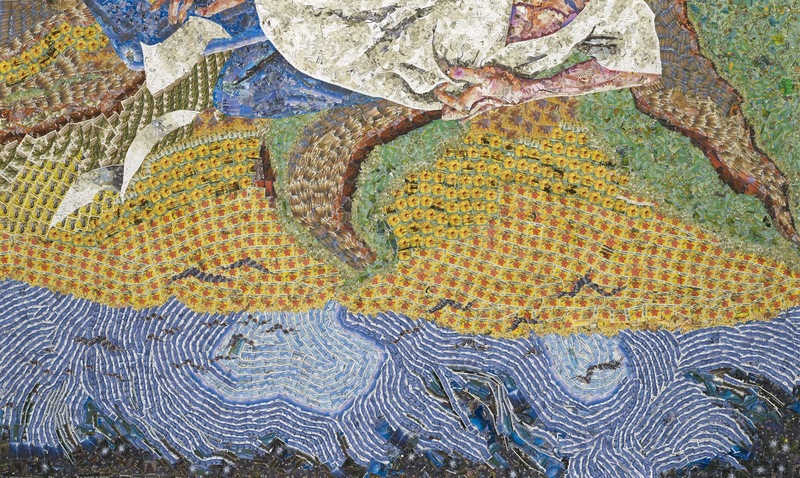 The gallery exhibited 6 recent large-scale works by Natee Utarit, Nadiah Bamadhaj and Chang Yoong Chia. Nadiah Bamadhaj’s Cina Wurung, Londa Durung, Jawa Tanggung (No longer Chinese, not yet a Dutchman, a half-baked Javanese) is a large paperwork created through the acts of collaging and drawing and was one of the 2 works she exhibited at START. The title for this drawing is documented from a 19 century Javanese colloquialism to describe Tan Jin Sing, a Kapitan Cina of Yogyakarta,(Indonesia) from 1803 – 1813. From a long-settled Hokkien peranakan family from Central Java, Tan Jin Sing went on to be the first person of Chinese descent to hold the title of regent in the Yogyakarta royal court (Kraton). The building in the image is a traditional shop house, which reflects the existence of hybridity within the Chinese community in Yogyakarta. Treading between the realms of drawing and sculpture, Nadiah’s laboriously crafted paper-works merge the practice of drawing with collage, magnifying architectural structures and characters into gigantic reliefs that appear almost sculptural. 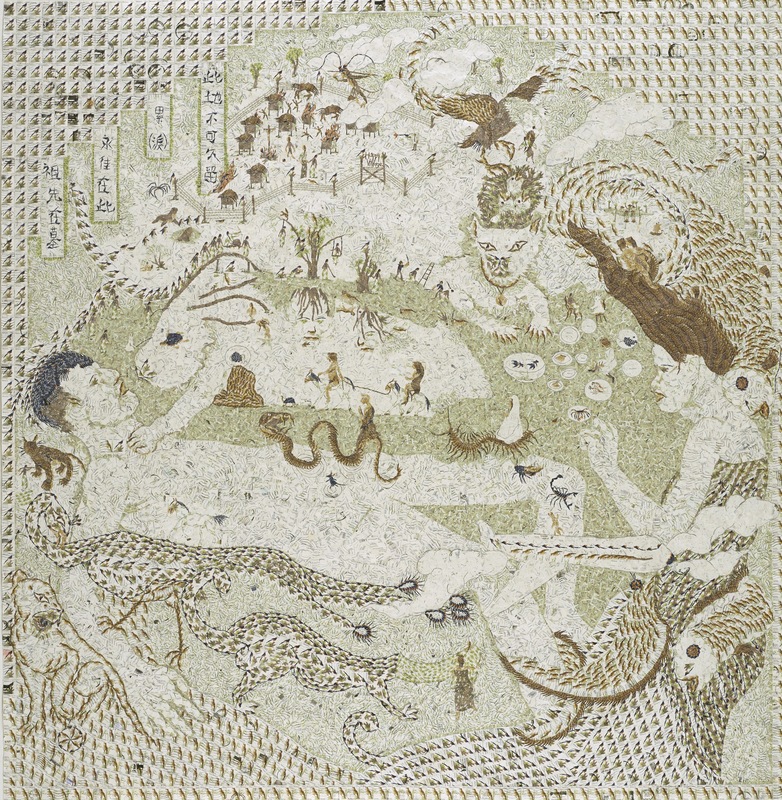 Chang Yoong Chia presented 3 works at the fair, one of which is The Dollar Sign, a massive and intricate collage constructed fully out of stamps without a material backing and depicts the Petronas Twin Towers guarded by two gigantic serpents, a large snake and the mythical Chinese dragon. The monstrous brown snake created out of hundreds of mundane stamps with the oil palm fruits’ image seems to be cradling the large architectural structure while the green dragon hovers elegantly into the sky. Both snakes in relation to the structure of the twin towers visually echo the dollar sign. The work is a commentary on Malaysia’s dependency on both the petroleum oil and the palm oil, along with its obsessive consumption of both precious resources; which led to the modification of the physical and cultural landscapes in the country. Natee Utarit’s When Adam delved and Eve Span, who was then the gentleman? is a large multi- panelled painting which appropriates the format of a Christian altarpiece and depicts a complex symbol laden scene filled with figures drawn from life, ranging from a doll house, two human skeletons, a chimpanzee to a trio of standing ferrets. The title of the work derives from the famous opening lines of a sermon delivered by the renegade priest John Ball who instigated the peasant revolt of 1381. His sermon captured the feelings of the disenfranchised lower classes of England at that time chafing against their subjugation and unpaid exploitation by the ruling orders of society. The work explores the power structure within the international art system along with establishing a specific stance in relation to it. N a t e e U t a r i t (b. 1970, Bangkok, Thailand) studied at the College of Fine Art in 1987 and graduated in Graphic Arts at the Painting and Sculpture Faculty at Silpakorn University, both in Bangkok, Thailand in 1991. Initially influenced by German Expressionism and abstract art in his early body of work, Natee has undergone an exploration on the medium of painting connecting it with photography and classical Western art. Light and perspective are some of the elements the artist chose to work with, focusing on painting as a means to explore image making. His complex pictures, juggle wide-ranging metaphors usually in the format of the traditional still life, allude to Thailand’s current social and political landscapes.